It is a good thing that tower plates often come pre-drilled for popular varieties of bearings and rotators. 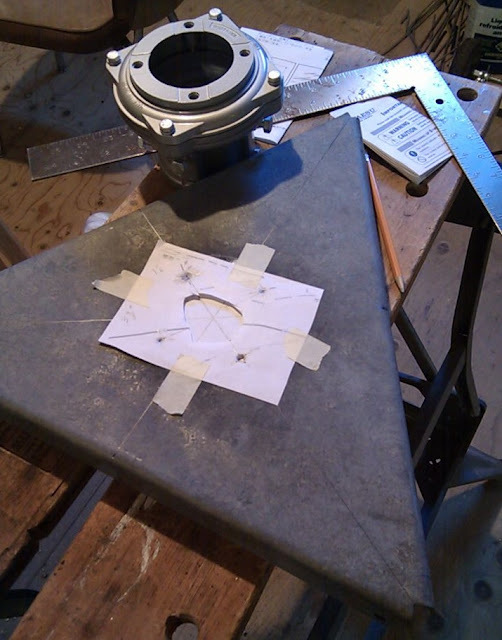 For all other cases there is some effort required to do this right, including centering drilling templates, locating the mounting holes and finally drilling the plates. There is no magic involved other than attention to detail and using the right tools. Get it wrong and the bearing or rotator will bind or at least experience stress for all or part of the rotation circle. That can lead to unexpected failure, although it might take a few years depending on the severity of the error and frequency of use. Unfortunately the rotator and bearing plates on my Trylon tower are not drilled for a Hy-gain Tailtwister and a 4-hole bearing flange. There is a rotator plate on the top section that is drilled for the Tailtwister, which I am not using since I am mounting the rotator on the next lower section to allow stacking above the tower with a long mast. I decided to take a few pictures of my work and write it up in case this could prove useful to others. There are other ways to do the job, some perhaps better than my way. However if you have never done it and you need to do it this article may give you some ideas and the confidence to do the work. The top plate for the 4T section and the 5 section (purchased used) are drilled for a 3-hole bearing flange. All the plates include a large circular opening for the mast, which is very helpful since that hole is not easy to machine in the typical ham workshop. Ordinary hole saws don't do well on steel! The first task was to remove the two plates from the tower sections. These are the formed sheet steel plates that Trylon stopped producing about 25 years ago. 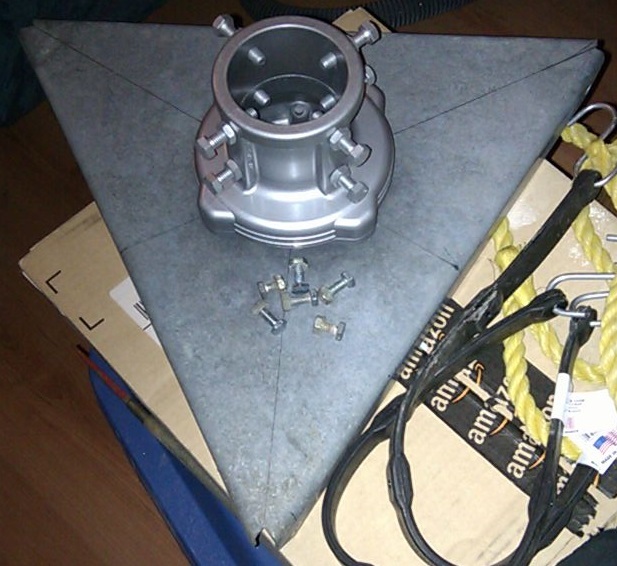 New plates are flat and sit on angle brackets that bolt to the tower legs. Both have their challenges when it comes to drilling. The rest of this article will be about the bearing plate. The rotator plate was done the same way. It is only chance I'm doing it this way since the rotator plate was already done and out in the snow with the tower section when I decided to write this article. To begin I taped a sheet of paper under the plate. This is needed since (obvious, I hope) the centre will fall within the large cutout. There are three lines drawn between the centre of each side and the opposite vertex. When it's done right the lines should cross at the same point. Don't cheat and draw only two of the lines since there are many ways the lines can be misdrawn and with only two you won't know if an error has been made. A careful inspection of the plate shows that the three bends are not exactly the same; that is, the plate is not symmetric. All of my three plates are off a small amount. Therefore we cannot rely on the edges of the plates as accurate centering guides. The best guides for these plates appears to be the bolt holes that attach the plate to the tower legs. There are six of these. They must be in the correct location of the tower section splice would be misaligned. Perhaps Trylon drilled the holes in a jig after bending the steel to account for type of small errors in the bend locations. For other tower brands you should be able to find and use other centering guides. Since the top plates are adjacent to the splice holes the distance between holes on each vertical tab are almost exactly an integral number of inches: 15" in the case of the 4T bearing plate and 18" for the 5T plate. It isn't difficult with a steel carpenter's rules or square to bisect the line between the bolt hole centres and mark it with a pencil (not a pen). I then used the small square shown on the photo to project that point onto the plate surface. A line is then drawn from that mark to the opposite vertex. You may need to use a similar method to bisect the line between the bolt holes adjacent to the vertex since there is no reliable landmark at the vertex to rely on. A small box is placed underneath the plate to allow the pencil to mark the paper. If the lines don't cross within 1/8" or less check your work. Keep in mind that the angle of the pencil alongside the ruler or steel square can error cause an error of 1/16". Keep the angle constant while drawing and ensure it precisely hits the marks you made at each end. Bearings and rotators almost always include a drilling template. However whether it is already on paper or you print it yourself do not rely on its accuracy. Scaling errors have a habit of creeping in from the original machinist's template to software to printer. If you are lucky enough to have a bearing or rotator where the mounting holes stand clear of the body drawing the template is quite easy. 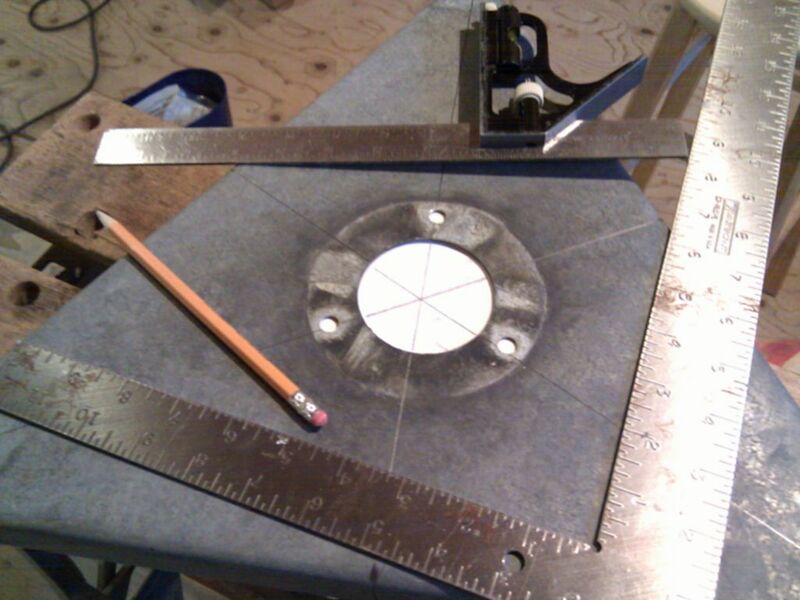 Place it on a sheet of paper and with the pencil held vertical draw a circle around the inside of each hole. For blind mounting holes found in most rotators and some bearings it is less easy though still straightforward. My preferred technique is to tape a sheet of paper over the equipment itself and punch the holes with a pencil or by pushing the mounting bolts through the paper and engaging the threads. I used the former for the bearing and the latter for the rotator. For either clear or blind holes use a ruler to draw lines between the centres of opposite holes. These ought to intersect at a point. If there are only two lines, in the case of 4 blind mounting holes, ensure that the four sides of the square formed by the holes are equal to confirm that the intersection point is truly the centre. Since paper isn't transparent it is necessary to find a way to ensure the centres of the plate and template are aligned. One way (pictured) is to cut out the middle of the template and use a ruler to ensure the centre of each line on the template is located at the plate centre. Another technique is to push a small nail or tack up through the plate centre, support it on a solid surface and push the bearing template centre onto the nail. Either way you now have a drilling template properly centred on the tower plate. You can rotate it to any preferred orientation (if you care). In my case it did matter since the existing holes on the plate had to be avoided. I reused one of the existing holes since the holes often overlapped and I could reduce the amount of drilling, and possible weakening of the plate. A centre punch in each template hole provides a dimple for the drill bit. I use a ⅛" bit to make a pilot hole before using a bit of the required diameter. I always use at least one step larger hole than the bolt shaft so that there is some play to allow final adjustment for mast alignment. The Yaesu bearing you see uses M8 bolts so I made the mounting holes ⅜" (9.5 mm). Remember to deburr the holes to protect your skin and to ensure the hardware mounts flush against the plate surface. I used a round file to lengthen that one previously existing hole since it wasn't quite in the correct position. When you're done turn the bearing or rotator upside down and place the drilled plate over it. The holes ought to align. If there is a small misalignment in one hole get to work with a round file or reamer. When you're done you can be confident that the bearing or rotator is correctly centred on the plate. Mast alignment should require little additional work once everything is installed on the tower. Above you can see the bearing mounted on the 4T top plate along with the bolts for reattachment to the tower section. The pencil marks can be left as is unless you enjoy doing unnecessary work. The weather will soon enough do the work for you. I'll leave you with one positive note. When a long mast is used the rotator is (and should be) mounted lower in the tower. Centering errors cause fewer problems as the distance between bearing and rotator increases. If you are unsure of your machining skills all you need do is mount the rotator lower. That will also put you in good stead should you later decide you want a longer mast.